The area between Fužine and Mrkopalj is mountainous terrain covered in forest and dominated by the mountains of Viševica and Bitoraj. These mountains are in fact one mountain unit that is only partly separated by a forested valley at high elevation. Like all other ridges of Kapela and Gorski kotar, the consecutive ridges of Bitoraj and Viševica spread in the same northwest to southeast direction as the Dinarides, in the form of an elongated range with two slopes. The littoral slope steeply descends to Ličko polje, while the continental slope descends somewhat more mildly to the area of Sunger and Mrkopalj. Viševica has a conical peak, while Bitoraj has an elongated mountain ridge called Piršova kosa, covered in forest and without a clearly visible peak. Due to frequent and strong bora wind, Bitoraj is also known as Burni Bitoraj ("Bora Bitoraj"). 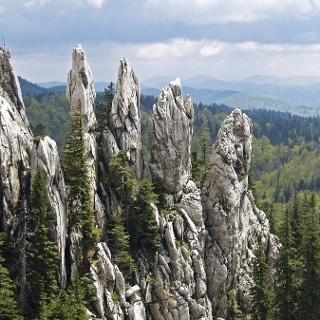 Unique characteristic of this mountain are numerous stone shapes hidden in the forest. On the other hand, the impressive conical peak of Viševica is clearly visible from far away, and it represents one of the most beautiful viewpoints of Gorski kotar, given the width and beauty of the view it provides. The peaks of Viševica and Bitoraj are 4 kilometers apart, separated by the pass of Javorje. There are no settlements in the zone between Fužine and Vrata to the north and Sunger and Mrkopalj to the east, so the White Line takes hikers through a solitary forest area. It is best to start the climb to Bitoraj from Vrata, where there is a railway station. A marked trail leads from the railway station towards Bitoraj, branching into several trail options (taking 2.5 to 3 hours). One good access route is also available from Lič – a settlement south of Fužine – along the Gorski Kotar Hiking Trail. The trails from Vrata and from Lič meet on the mountain pass of Javorje below the peak of Bitoraj. Not far from the peak of Bitoraj, there is a simple mountain shelter. From the peak of Bitoraj onwards, the White Line of Via Dinarica continues along the Gorski Kotar Hiking Trail towards the peak of Čelimbaša above Mrkopaljsko polje. There is a ski slope on that peak, and also a permanently open mountain lodge Bijele stijene nearby, in the village of Tuk.